Monday [15 October 2018] was a demanding day’s work, with a two-part programme for priests and readers in the diocese on preparing and resourcing Remembrance Day [11 November 2018]. I spent much of this morning and afternoon preparing liturgical and preaching resources for Sunday week, the Fifth Sunday before Advent, which may also be observed as the Feast of Saint Simon and Saint Jude, and as Bible Sunday. The lectionary readings for the Fifth Sunday before Advent offer an interesting contrast between silence and listening to God. In his sufferings, Job has been silenced before God, and now realises his need to listen to God (see Job 42: 1-6, 10-17). The Psalmist wishes to praise God all the time so that ‘his praise shall ever be in my mouth’ (Psalm 34: 1). The response provided for this Psalm is: ‘I sought the Lord, and he answered me, and delivered me out of my terror’ (Psalm 34: 4). In the Gospel reading (Mark 10: 46-52), when Bartimaeus the blind beggar realises he is in the presence of Christ outside the gates of Jericho, ‘many sternly ordered him to be quiet, but he cried out even more loudly’ (verse 48). There are moments to cry out loudly in the presence of God, and there are moments when silence is so appropriate. But there are times too when the seeming silence of God is more difficult to understand and to wrestle with than our own silence, as Job realised in the earlier readings from the Book of Job over recent weeks. So, in my prayers and silent reflections today, my thoughts turned to the icon of Christ the Blessed Silence, an icon found in some traditions in the Greek and Russian Orthodox Churches, but that is not so well known outside Orthodoxy. 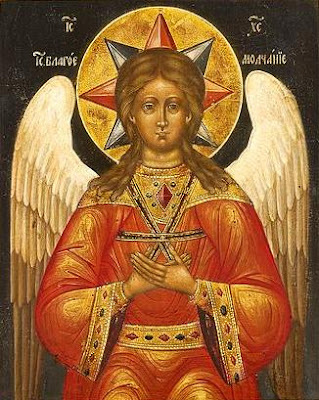 In this icon, Christ is portrayed as a youthful figure looking like a winged angel, his hands crossed against his chest, sometimes wearing a bishop’s mitre and dressed in a sakkos (σάκκος), the vestment worn by Orthodox bishops. In most of these icons, Christ is shown with an eight-pointed, shining nimbus. The icon of Christ the Blessed Silence represents his sacrifice, through his young face and crossed hands, and his ecclesiastic mission in his attire. His angel-like face and the wings point to his ministry. In some of these icons, Christ is bareheaded, in others he wears the crown of a bishop, to show that he is both the Great High Priest and the King of Kings. In some icons of Christ the Blessed Silence, Christ holds the cross, spear and sponge of the Crucifixion. The tradition of icons of Christ the Blessed Silence developed in the 14th and 15th centuries on Mount Athos, in Greece and in the Balkans. In Greece it was associated in Greece with the tradition of Hesychia. This Blessed Silence of Christ associates this icon with the hesychasts in the Eastern Orthodox tradition – the Greek ἡσυχία (hesychia) is a word for silence or quiet. 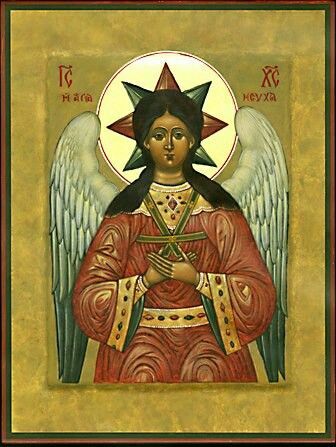 This icon is known in Russian as Spas Blagoe Molchanie or the Saviour of the Blessed Silence, and even as the Angel of Great Counsel. The earliest icon in this tradition in mediaeval Rus dates from the late 15th century. Christ is portrayed on the iconostasis or icon screen in the Dormition Cathedral in the Kremlin in Moscow, above the entrance to the sanctuary and dates from about 1482 or perhaps later (1514-1515). This image was widespread in the 17th century, and it found special reverence in the 18th and 19th centuries among the Old Believers in Russia. Many of these icons were confiscated from the Old Believers and kept in archives in St Petersburg. The icon of Christ the Blessed Silence Saviour is one of the few types in which Christ is represented in the form of an angel. In these icons, Christ is young and without a beard, looking like an angel or messenger, the angel of the blessed silence. The word angel is derived from the Greek word αγγελος (angelos), meaning a messenger. Saint John the Baptist is often represented with the wings of an angel, because he is described in Saint Mark’s Gospel as an αγγελος (angelos) or messenger. This icon is deeply mystical and symbolic. This is the Christ of the prologue in Saint John’s Gospel, the eternally existing Word. Christ’s eight-pointed crown or nimbus is known in iconography as the star of the Ancient of Days This crown can be seen as two superimposed squares, one red denoting the Passion, and the other olive green denoting the spirituality of the Trinity. This eight-pointed or crown signifies the six days of Creation with the seventh day of rest and the eighth day, the Day of Eternity, that preceded the Creation and that follows it. 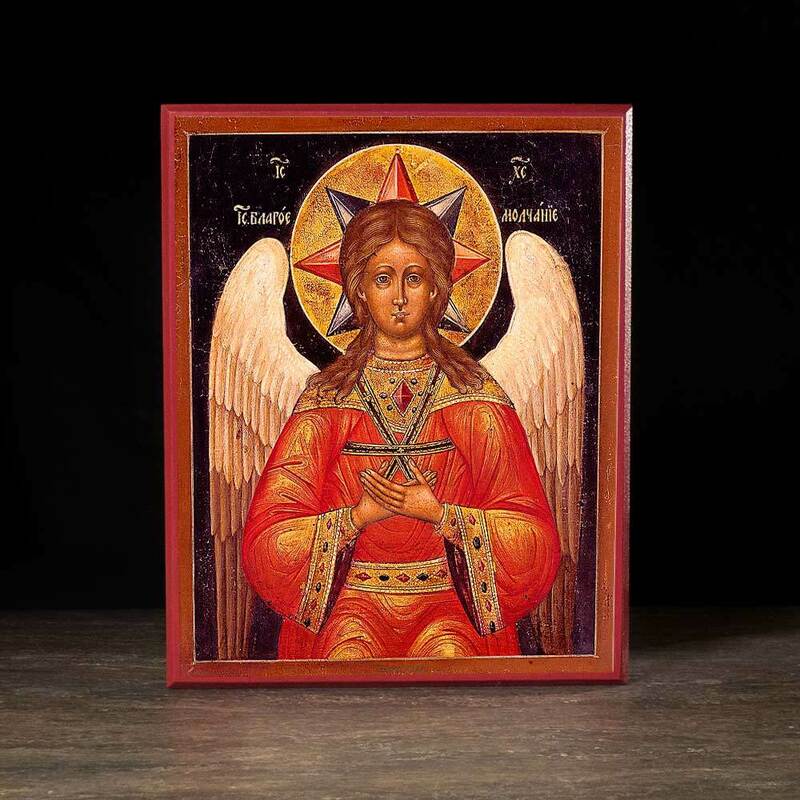 The seraphim often depicted hovering above the hands are symbols of the Nativity, but like many iconographic images, they link the birth and the death of Christ, as in the icon of the Crucified Seraph. So, we have here a representation of the Christ who eternally proceeds from the Father in sacred Silence and the Christ who was born in time to be the Suffering Servant who died in Silence. So, the suffering Christ was silent, and Christ the Angel of Great Counsel is the Son of God begotten in the Silence of Eternity. or make it heard in the street (Isaiah 42: 2, NRSV). for I will bring peace upon the princes, and health to him. His government shall be great, and of his peace there is no end. ἐγὼ γὰρ ἄξω εἰρήνην ἐπὶ τοὺς ἄρχοντας, εἰρήνην καὶ ὑγίειαν αὐτῷ. Prince of Peace, Father of the Age to Come. οὐδὲ γὰρ ἀπ’ ἐμαυτοῦ ἐλήλυθα, ἀλλ’ ἐκεῖνός με ἀπέστειλεν. For I came from God and now I am here. I did not come on my own, but he sent me (John 8: 42). When we think of the icon of Christ the Blessed Silence, we should think both of the Logos begotten from God in Eternity and of the birth of the Christ Child in time. The word of God that speaks to Job who was forced to live outside the city in that Sunday reading is the same word of God that speaks to blind Bartimaeus outside the city gates of Jericho. He is the one who was, who is and who is to come, the one to cry out loud to and the one in whose presence we should be silent too. Be still, for the presence of the Lord, the Holy One, is here. Come, bow before him now, with reverence and fear. In him no sin is found, we stand on holy ground. he burns with holy fire, with splendor he is crowned. How awesome is the sight, our radiant King of light! Be still, for the glory of the Lord is shining all around. he comes to cleanse and heal, to minister his grace. be still for the power of the Lord is moving in this place. As I stood at the bus-stop in Abbey Street, Dublin, at the weekend, waiting for a bus to Clontarf, I noticed the way the former Scots Presbyterian Church and its former church hall have been incorporated tastefully into the headquarters of VHI Healthcare. I have memories of meetings of Christian CND and the Student Christian Movement (SCM) in the church hall in 1980s, but the church has been closed since 2003. McCauley Daye O’Connell Architects were appointed to design the expansion of VHI’s offices on Abbey Street into the adjacent disused Presbyterian Scots Church which is a protected structure. The VHI wanted to stay in its current location but needed to adapt the former church and the adjacent church hall, which had fallen into disrepair and were suffering from vandalism. The key concept and challenges of their dynamic design were to respect and preserve the cultural, religious, historical and architectural heritage of the church and its ancillary buildings while meeting the client’s needs for a new, innovative and sustainable office extension. This extension needed to fully integrate with the existing office accommodation, giving VHI improved and sustainable office facilities. And so, the former church and church hall were completely refurbished and returned to full use. The new design provides a public entrance foyer in the former church, making it the primary public zone and entrance area for the building. 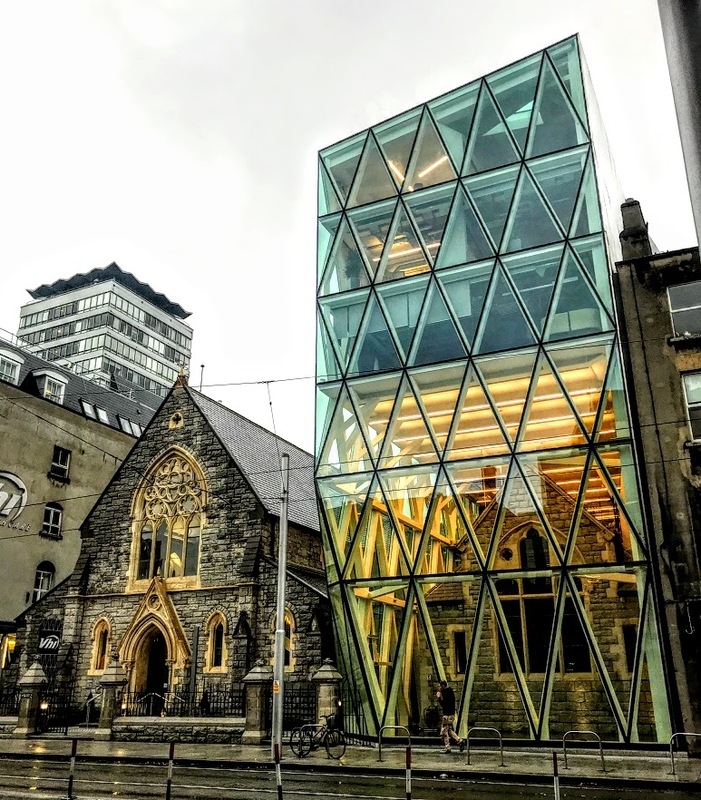 It also provides new office floors suspended above the original church hall, all contained within a contemporary triangular exo-skeleton lattice design that provides the external structure, creating a building that is light and transparent and contrasts and complements the original Gothic church design. The design incorporates a mix of highly insulated opaque and glass façade panels, natural ventilation through the perforated façade panels, good natural lighting, fully integrated solar panels in the roof system and rainwater harvesting. The United Presbyterian Church of Scotland began working in Ireland in the 1840s but met with little initial success. This mission was aimed mainly at the Scots living in Dublin, and the first congregation may have met first in Aungier Street and then in Whitefriar Street. By 1863, the congregation was meeting in the Pillar Room of the Rotunda Hospital. A formal congregation was installed in 1866 and the Revd James Stevenson became the first minister. Mission work also began in the North Strand area aimed at the many Scots living in that area. A site was bought in Abbey Street in 1866, the foundation stone of the new church was laid on 6 May 1868, and a new church was built in 1868-1869 at a cost of £6,000. This was a gable-fronted three-bay double-height Gothic-Revival church in a style that was described as ‘Geometric Gothic,’ and it was designed by the Limerick-born architect, William Fogerty (1833/1834-1878), who also worked in Dublin, London, and New York during a short but intensive and creative career. William Fogerty was a born in 1833 or 1834 into a well-known Limerick family of architects. His father was the architect John Fogerty, and an elder brother was the architect Joseph Fogerty. He studied at Queen’s College, Cork (now UCC), before joining his father’s practice in Limerick with his father in the 1850s. He was working from 97 George’s Street, Limerick, in 1861-1863. His work during his time in Limerick included the Protestant Orphan Society Hall (1855-1856), the addition of an apse in Holy Trinity Episcopal Church on Upper Catherine Street (1858-1859), new Church of Ireland parish churches in Athea (1858-1859) and Killeedy (1862-1863), the Goold Memorial Cross in Athea (1863), and a new courthouse in Adare commissioned by the Earl of Dunraven (1863). He moved to Dublin in 1863, and was elected a Fellow of the Royal Institute of Architects of Ireland (FRIAI, 1863) and a council member (1867-1868). A year after designing the Scots Church on Abbey Street, Dublin, he went on a tour of Italy in 1869 with Thomas Henry Longfield. He then moved to London, where his brother was already in practice as an architect, and practised from Westminster Chambers, Victoria, and 8 Buckingham Street. From there he moved to New York, but he soon returned to Ireland and in 1875 he announced in the Irish Builder that he had resumed practice at 23 Harcourt Street, Dublin. He continued to practise in Dublin until he died from smallpox at the age of 44 on 22 May 1878. He was buried in the churchyard at Saint Munchin’s Church, Limerick. Fogerty’s church on Abbey Street was built by Crowe and Sons of Great Brunswick Street (now Pearse Street), Dublin, in granite, with dressing of limestone and freestone, at a cost of £6,000. The church was designed with a nave measuring 70 ft by 28 ft in the clear, two side aisles, each 8 ft wide, separated from the nave by light columns and arches. The ground floor was to seat 450 persons, with another 70 in the gallery. The main entrance was in the centre of the nave facing Lower Abbey Street, with a spacious porch and vestibule, with separate side entrances to the vestibule and school-room. The original details include granite coping, a granite chimneystack, stepped lateral buttresses, gableted buttresses, pointed-arched windows, hood-mouldings, four-part geometric tracery windows, trefoil-headed windows, a pointed-arch compound moulded doorcase, wood-grained timber doors, colonettes with stiff-leaf capitals on octagonal plinths, and clerestoreys. There was a lecture-room and a range of vestries at the rere, and a school-rook 45 ft by 22 ft at the side. Fogerty’s originally designs for the church included a tower and spire, rising to 110 ft, at the north-west angle, but they were never built. The church was formally opened in April 1869 by the Revd Professor John Eadie of Cambridge Street Church, Glasgow. The Revd James Stevenson was succeeded by the Revd William Proctor in 1884. Six years later, the neighbouring single-storey church hall was built in 1890 in the Gothic Revival style to designs by the Belfeast-born architect Sir Thomas Drew (1838-1910). Drew was a son of the Revd Canon Dr Thomas Drew, ‘a militant Orange’ clergyman who was Rector of Christ Church, Durham Street, Belfast, and later of Loughinisland, Co Down, and Precentor of Down Cathedral. The younger Thomas Drew was articled in 1854 to Charles Lanyon, who later went into partnership with William Henry Lynn. Drew was Lanyon’s superintendent and clerk of works in 1858-1861. In 1861, he formed a brief partnership with Thomas Turner in Belfast, but the following year he moved to Dublin, where he became principal assistant to William George Murray. Drew became diocesan architect of the United Dioceses of Down, Connor and Dromore in 1865, but remained Murray’s chief assistant until 1867. Later he practised on his own, although in 1870 he worked closely with William Fogerty before Fogerty moved to the US. Drew reached the peak of his career with his design for Saint Anne’s Cathedral, Belfast. He was also the consulting architect for Christ Church Cathedral, Dublin, after its restoration by George Edmund Street, and for Saint Patrick’s Cathedral, Dublin, Saint Patrick’s (Church of Ireland) Cathedral, Armagh, and Saint Columb’s Cathedral, Derry. He was also responsible for the restoration of Christ Church Cathedral, Waterford, advised on the restoration of the nave pillars in Truro Cathedral, and designed the former Soldiers’ Institute near the Phoenix Park in Dublin. Drew was president of the Royal Institute of Architects in Ireland (RIAI, 1892-1901), the Architectural Association of Ireland (AAI, 1875-1876), the Royal Society of Antiquaries of Ireland (RSAI, 1894-1897) and the Royal Hibernian Academy (RHA, 1900-1910), the only person to ever hold all four positions. He was a one-time editor of the Irish Builder, gave frequent papers on architectural and antiquarian topics, and for many years delivered a lecture on the history and fabric of Christ Church Cathedral at Strongbow’s tomb every Saint Stephen’s Day. He was Professor of Architecture at the RHA (1884-1910), and in 1894 he became professor and lecturer in architecture at the Metropolitan School of Art. Drew was knighted in Queen Victoria’s birthday honours in 1900. He received an honorary degree of LL.D. from Trinity College Dublin in 1905. Two months before his death, he was invited to become the first Professor of Architecture in the National University of Ireland. He died on 13 March 1910 and was buried in Dean’s Grange cemetery. He married Adelaide Anne, sister of William George Murray, in 1871; she died on 9 January 1913. Meanwhile, the Free Church of Scotland and the United Presbyterian Church formed a new union in 1900, and the congregation became part of the United Free Church of Scotland. Membership of the congregation peaked in the 1910s at 448 people. The congregation joined the Presbyterian Church in Ireland in 1929 and took the name Scots Church. In 1938, the Ormond Quay congregation – which was founded in 1848 but dated back to 1707 – and its minister, the Revd Thomas Byers, joined Scots Church in Abbey Street and the church became known as Ormond Quay and Scots Presbyterian Church. The church building on Ormond Quay remained the home of the Dublin City Mission of the Presbyterian Church until the late 1940s, when it was acquired by Dublin Corporation. The dwindling congregation of Ormond Quay and Scots Church decided to close its church in Abbey Street and to amalgamate with the Presbyterian Church in Clontarf in 2003. The Presbyterian Church in Clontarf traces its roots to the two Secession congregations in at Mary’s Abbey and Mass Lane in Dublin that merged 200 years ago to form the Union Chapel. The Secession Synod started a mission in 1836 to form a second Secession congregation in Dublin. In 1837, this congregation bought Ebenezer Chapel on the corner of D’Olier and Hawkins Street for £600 to use as their church. The congregation moved to a new church in Lower Gloucester Street, now Sean McDermott Street, in 1846. By the 1880s, many members of the congregation were living in the new suburbs of Fairview and Clontarf. In 1888, the Gloucester Street church decided to move to Clontarf, a site was found on the corner of Howth Road and Clontarf Road and the new church opened in 1890. The Clontarf congregation welcomed the members of Ormond Quay and Scots Church in 2003, and the church in Clontarf is now known as Clontarf and Scots Presbyterian Church. The minister of Clontarf and Scots Church, the Revd Lorraine Kennedy-Ritchie, was one of the speakers at the Clontarf Ecumenical Conference on Saturday.